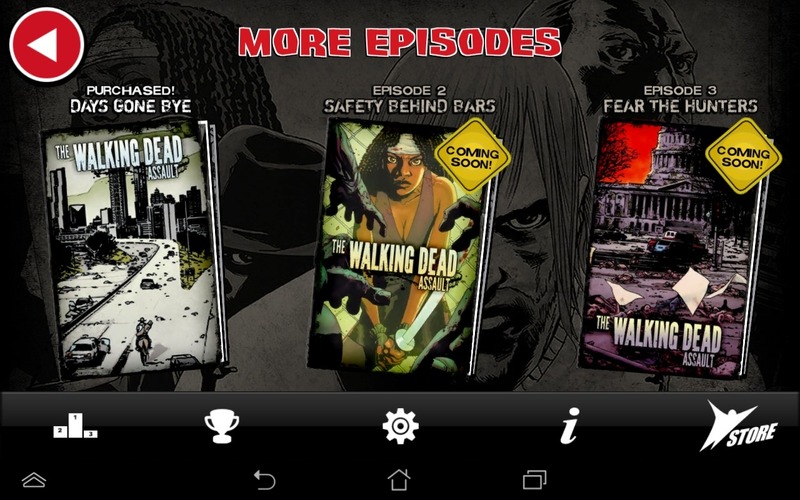 It's not much of a secret that I'm basically obsessed with The Walking Dead. When new seasons air, Sundays are easily my favorite day of the week – every passing moment leading up to the start of each week gets me one step closer to finding out what's going to happen to Rick and the crew next. Season finales are always bittersweet – they usually provide at least some sort of closure to the intensity of the season, but I also know it will be months before new episodes are out. October already can't get here soon enough. Still, when The Walking Dead: Assault hit the Play Store, I was wary of it – it's not uncommon for movie or TV-based games to be complete crap, simply made to grab money from the die-hard fans. I hoped Assault wouldn't be one of those, so I threw down the $3 asking price and fired the game up to see if it could live up to the standards set by my love for the show. Spoiler alert: I haven't really been disappointed yet, save for a couple of minor annoyances. 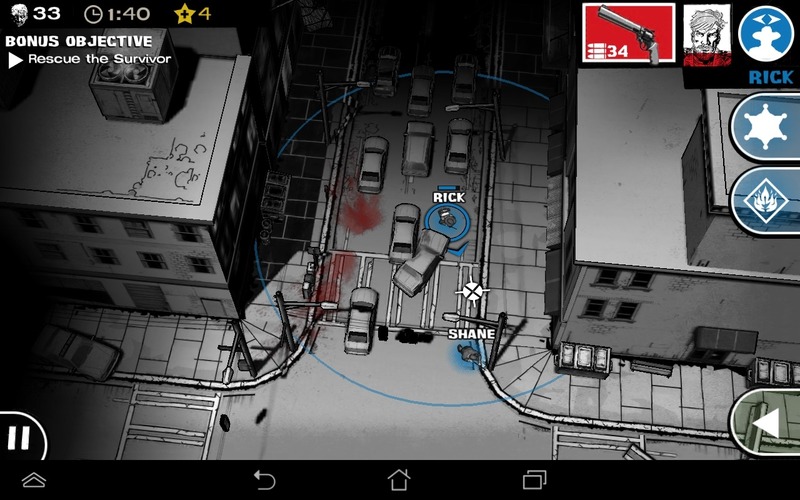 TWD: Assault is basically a top-down strategy game. As most games of this nature do, it starts off slow and simple, and progresses from there. 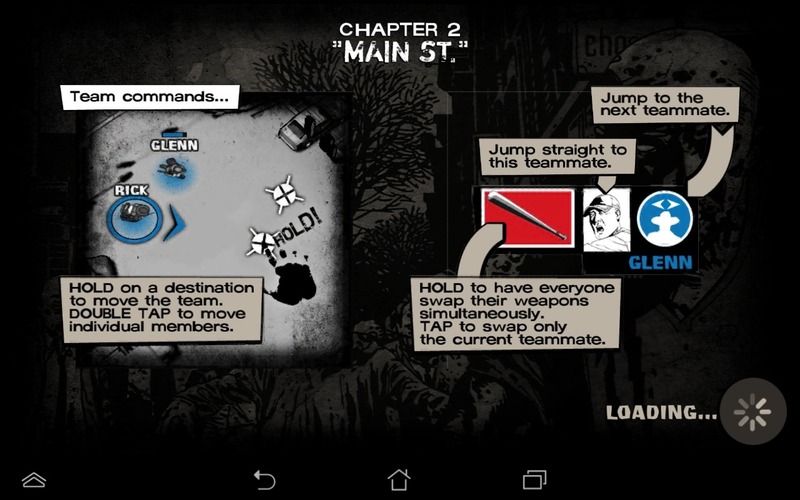 Staying true to its comic book counterpart, basically the entire game is black and white, sporting a hand-drawn feel. That actually makes a lot of sense, as the game is published by Skybound – the same company responsible for publishing the comics. Thus, those who love the comics will feel right at home in Assault. That, of course, doesn't mean it looks bad. On the contrary, in fact – I found the comic book-esque look and feel very refreshing. It doesn't need super high-resolution graphics or crazy amounts textural detail – this is The Walking Dead as it was originally intended. It's beautiful in its own right. 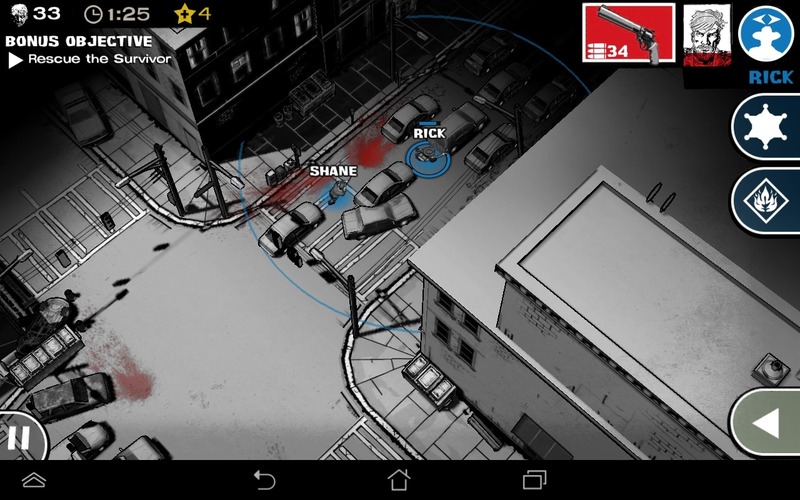 The control scheme couldn't be simpler and works exceptionally well on a mobile device: double tap to move a single character to a specific location, and long-press to move the entire group. 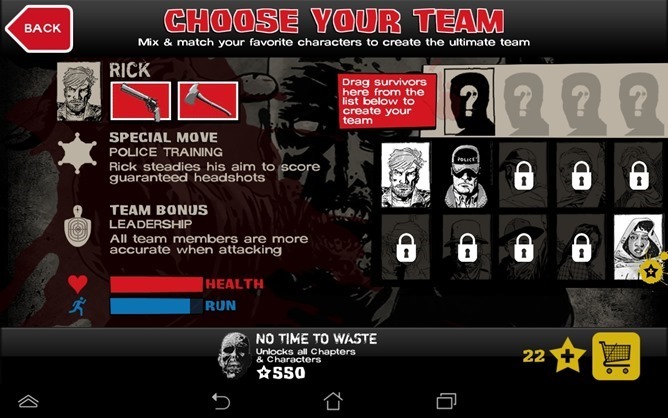 You'll spend the bulk of the game with a customizable team of four characters from the comic/show (more on that in a bit), so the latter method of navigating each level will quickly become the most oft-used. The game also features pinch-and-zoom, as well as camera rotation, which offers an in-depth look of the entire level. For example, if you can't see around the corner of a building, simply rotate the camera to unmask anything hidden – both good and bad. This works exceptionally well, so you should use it to your advantage. Each character has his or her own specific set of weapons – one melee and one ranged (typically) – along with a special move and team bonus. For example, Rick sports his trademark revolver for ranged attacks and an ax for melee, his special move allows him to perform headshots 100 percent of the time while the skill is active, and he provides improved accuracy to the entire team as a passive skill. This is the same basic format for all characters I've unlocked, save for Michonne, whose primary weapon is her katana and secondary slot is filled with just her fists (not that she needs anything more, Michonne is arguably one of the biggest badasses on the planet). 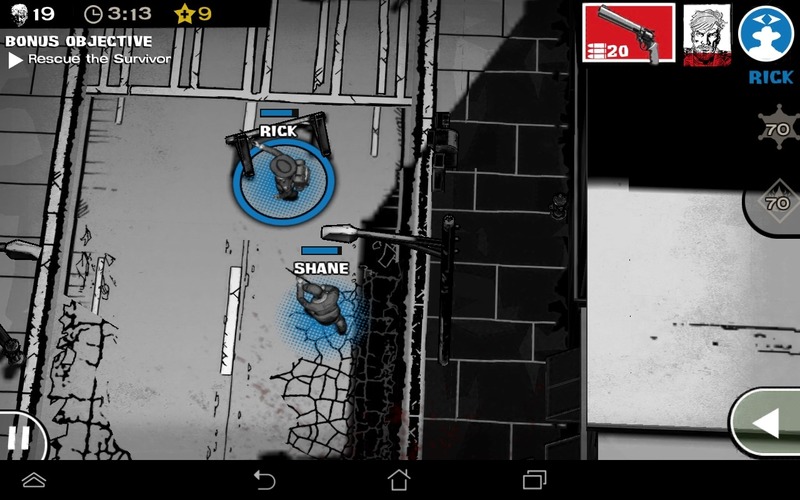 Each weapon has its own attacking range – Rick's revolver can cover a much larger area than Shane's short-ranged shotgun, for example. Naturally, melee weapons are the shortest-ranged of all. Before we get into how attacking works, I have some bad news: Daryl is nowhere to be found within Assault. 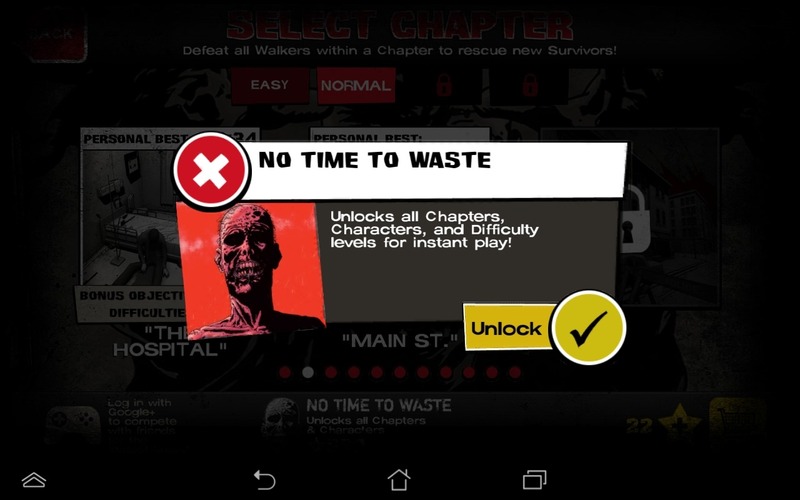 With each completed level, you unlock a new character, starting with Shane, and followed by Glenn, Andrea, Carol, Sophia, Dale, Carl, and Lori. No Daryl. Let's just hope he show up in Episode 2. Attacking happens automatically – get a walker within your weapon's specific range and they're toast (hopefully, anyway). 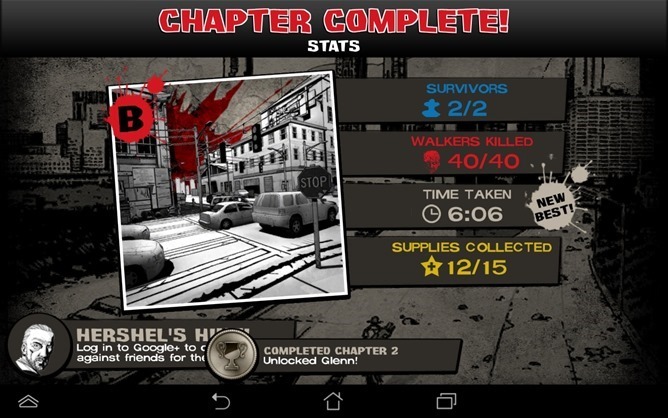 And that's kind of the point of the game: eliminate every walker in each level, collecting supplies along the way. But that's just the primary goal – every level also has varying secondary goals, like saving survivors, collecting all supplies, and more. This keeps things interesting, as the secondary goals are often much more difficult than simply killing hordes of undead. 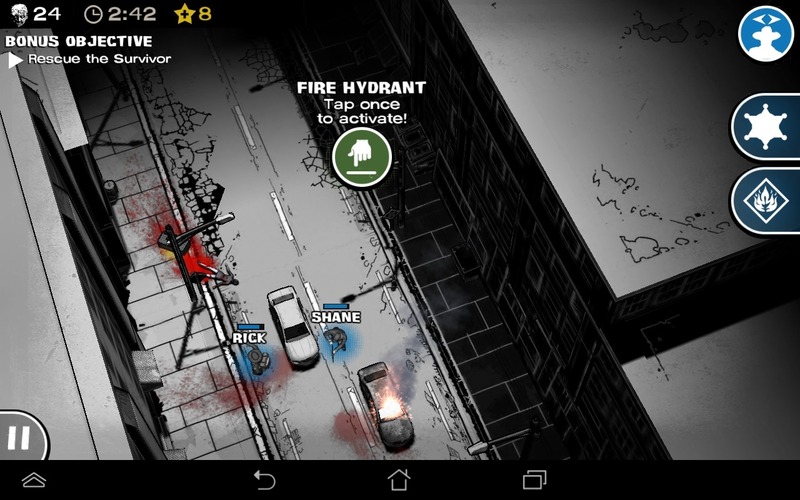 To aid in completing all goals (and surviving), however, there are certain environmental triggers that distract zombies, like corpses, car alarms, and fire hydrants. Again, these should be used tactfully and to your advantage; in other words, don't active a car alarm while your team is standing right next to said car. That's a bad idea. Speaking of supplies, that's the primary currency in Assault (it wouldn't make sense to use actual money, since it's completely useless in the post-apocalyptic world). This is used to unlock new characters and other tweaks. The regular characters are generally very affordable, but some – like fan-favorite Michonne, for example – are quite pricey. 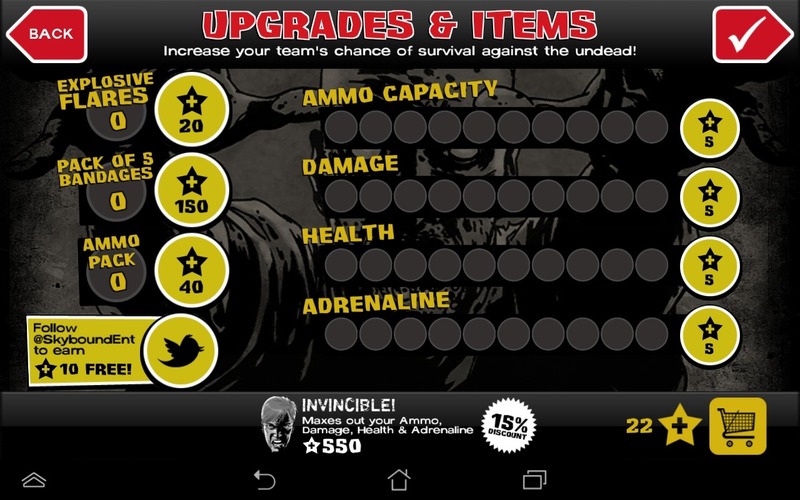 Aside from new characters, supplies can be used to add additional ammo, increase each character's damage dealt, increase health and adrenaline, or pick up in-game aids like explosives, bandages, and more ammo. There's even an option to skip all the fun an unlock all levels, difficulty levels, and characters, but why would you want to do that? 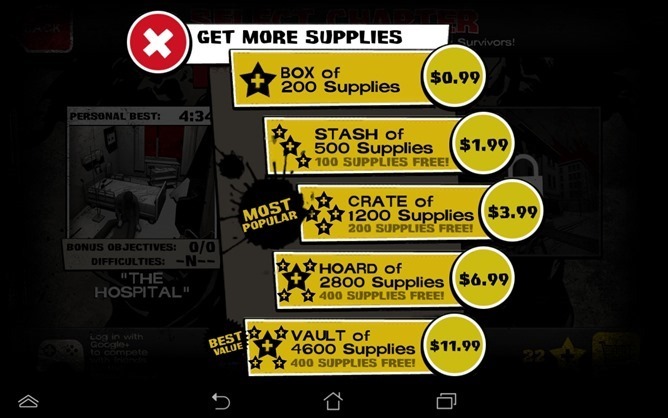 The in-game currency to real money ratio is pretty high with Assault – it costs 200 supplies just to unlock Michonne. Since she's available right out of the gate, it's pretty obvious the intention is to get you to spend a buck on her at the very beginning of the action. While I haven't yet spent a penny outside of the initial $3 cost to play the game, it has been very tempting – additional ammo, stronger characters, and the like are all extremely enticing (which is the point of IAPs, I suppose). That's where Assault falls short, unfortunately: while it's possible to play the game without spending real money on extras, it can be incredibly frustrating without some of the obvious extras. That said, it can be done, just make sure to collect every supply you can find in-game, and play the game methodically and tactfully. Really, that's good advice either way: be methodical, be tactical– that's what this game is all about. You'll need to conserve your ammo as best you can, because you'll never know when a horde of 10+ walkers will show up, and that's when you'll need all the firepower you can muster. The same applies to special skills – they're on a timer, so whenever you use one, it can't be reused for another 90 seconds. Basically, don't use Rick's "Police Training" or Shane's "Freakout" on a small group of walkers unless you know a large group isn't just around the corner. 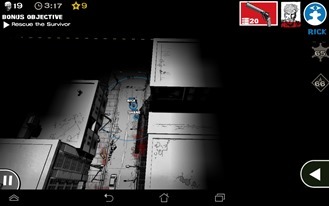 You have to play it smart – this is a strategy game, after all. Fortunately, the game warns you when a large group of walkers is ahead/approaching, allowing you to prepare your team for battle. IAPs aren't my primary complaint with this game, though. Its lack of good integration with Google Games is. 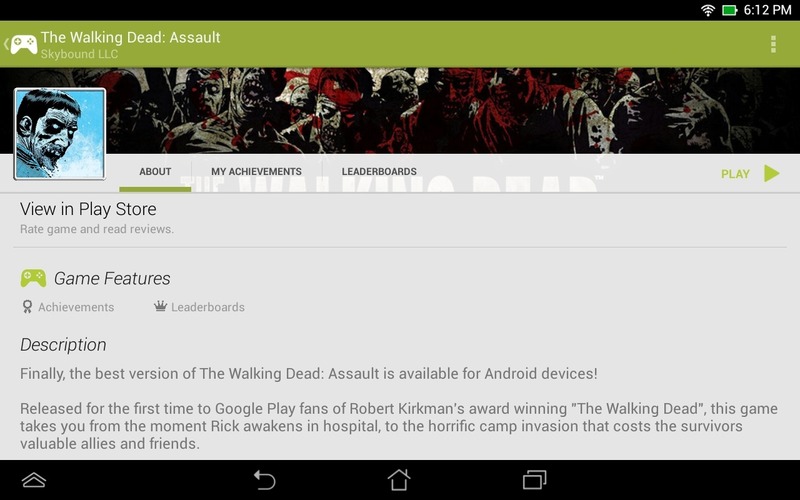 Like many other new games, Assault does have support for Play Games, but it doesn't sync your game data. It's basically used for leaderboards and achievements, and nothing more. Thus, if you have multiple devices, you'll have to play the same levels time and time again, as it doesn't actually sync your gameplay data (despite showing all completed achievements as such across all devices). This proved to be a real pain for me – I played over half the game on a review device that turned out to be faulty, so I had to send it back in exchange for another. When that happened, I lost all my game data and had to start over. Boo! I can't possibly fathom why Skybound chose to omit game data sync – I even reached out to them to find out if this was in the works, but didn't hear anything back. Guess it's not a huge deal if you only have one device, but it's still a major annoyance for those who have multiple. It's also worth mentioning that this is the first of a series – more episodes are "coming soon." I wouldn't count on those being free updates, either; they'll likely hit the scene as DLC add-ons requiring IAPs. 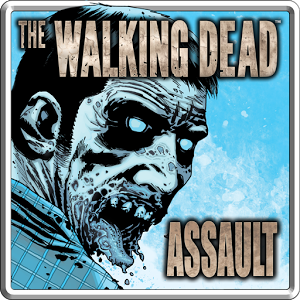 As far as mobile games go, TWD: Assault gets a big thumbs up from me, despite its [very few] downfalls. It's fun, challenging, and does The Walking Dead justice. 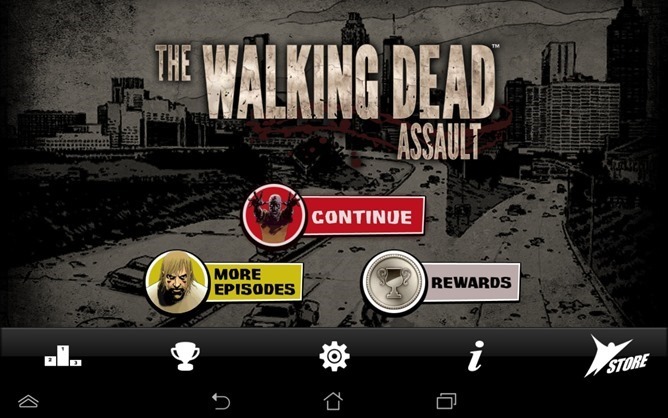 The best part, however, it's that it's a good game overall – not just a good game for Walking Dead fans. I think that anyone who enjoys this type of game could pick it up and have a good time playing, though TWD fans are more likely to get into (and appreciate) the storyline since they're already familiar with the characters. And, really, even if you do end up spending a couple bucks on IAPs, the end result is nothing to scoff at: you get a good, fun game for $5. Definitely worth it.